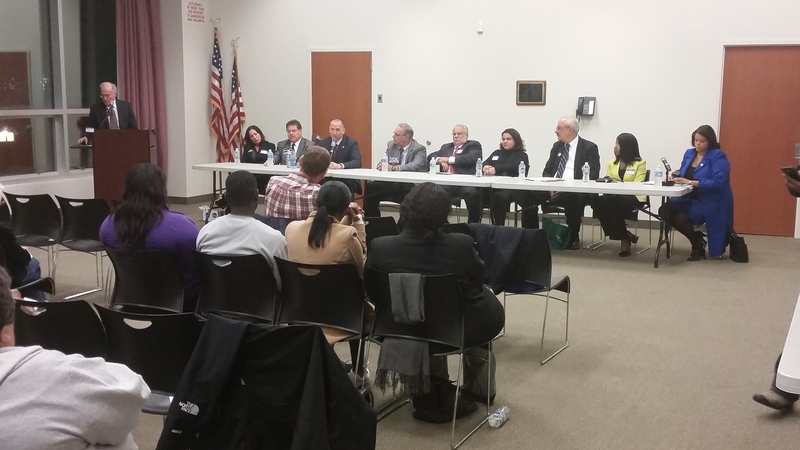 The Excelsior was in attendance this past Monday, together with an audience of residents, who came to hear the candidates for elected office share their views regarding Elmont, Nassau County and the State of New York. *Judge Sharon Gianelli was also present and addressed the audience – Judge Gianelli is a Nassau County District Judge running for election to the Supreme Court, 10th District. A staff person from Congressman Gregory Meeks’ office was also present. Congressman Meeks is the 5th Congressional District Democratic Incumbent, and is seeking re-election against Allen Steinhardt. An audience of residents gathered at Elmont Public Library on Monday Oct. 13, listening carefully to candidates before they make a vote in November. No longer than an hour and a half, the forum was efficient. A moderator set the rules. The evening would be split into 2 parts – State candidates for Assembly and Senate would be up first, followed by an opportunity to hear from local judges – each candidate offering reasons as to why they should be elected or re-elected. For meeting minutes or notes — which include questions asked by the moderator and answered by State Senate & Assembly candidates — please email us at thenewelmont@gmail.com. Meet the Candidates Night, 7 p.m.